If you don’t want to be picking up dirty socks and begging someone to put the dishes away for the rest of your life, it’s important you instill the value and habit of pitching in around the house when your kids are young. 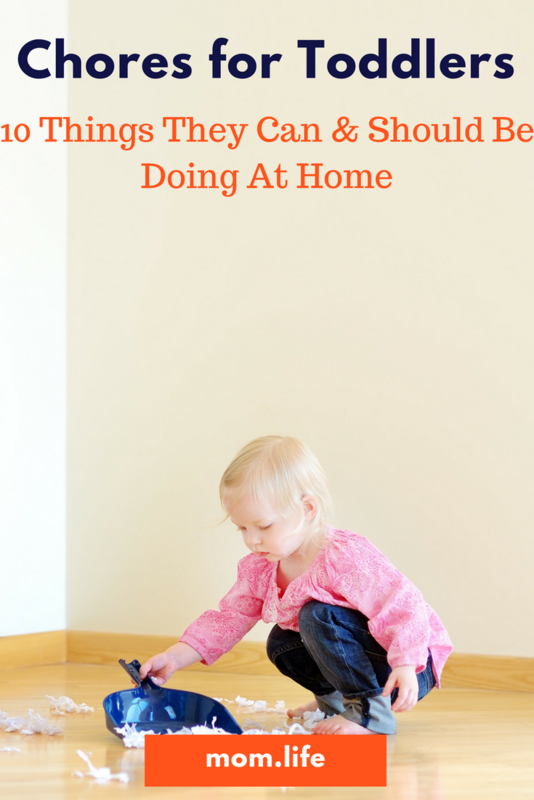 Yes, we're talking chores for toddlers. It's possible, we promise. From about 2-years-old, your child can be asked to complete simple tasks, including home chores. The cool thing is that lots of little people are eager to help out at this age! As much as you want to shoo them from the kitchen so you can just hurry up and get the job done, it will help you and them in the long run if you figure out a way to involve them in the process. So take advantage of their can-do attitude and put those little hands to work! Just remember to keep the tasks simple enough that they can do them successfully without much assistance from you (it’s okay to go back and fix it when they aren’t looking if necessary) and kindly thank them for their hard work when they’re finished (everyone likes to feel appreciated). Looking for some ideas to help intro your toddler pulling their weight around the house? Use this Toddler Chore List for guidance. Pick up her own toys. It teaches her the importance of cleaning up behind herself as well as that she needs to value her belongings. Making her bed. Not only is this a great habit to start, but it helps with the transition from crib to bed. This task gives toddlers ownership over their new digs and may even make them more eager to sleep there – instead of in mom’s room. Dusting. Kids love using a feather duster, but even without one they can help with this. Put a pair of old socks on their hands and send them around to “dust” the furniture. Putting away dishes. Especially the bowls and the pots and pans, and other items that are down low and not too sharp. If you're not ready for them to handle the glass items, make them the official tupperwear, cutlery and pots handlers. Put clothing in hamper. It’s just what you do when you take them off! Putting shoes in the closet. Or the basket or whatever your family does with them when they get taken off. Unless it’s throw them wherever, you don’t want her to do that! Helping in the kitchen. Getting your kids in the kitchen is not only useful, but quite fun! Empty trash cans. Not the big mama jamma in the kitchen, but if you have a little one in the upstairs bathroom or your office, they can easily go get them and bring them down for you. Added awesome: saves you a trip! Clean out the car. Most of the junk in there is probably theirs anyway! Once a week, walk them out with a little bag and point at all of the junk in the back seat you want removed. That includes toys, stray socks, the 8 sippy cups they life in there. All of it must go! Put away laundry. It will be ages before they are doing it themselves, but they can get in on the fun by helping you put it away. The task is super easy if you’ve labeled their drawers, but regardless, show them where the socks go and tell them to add the clean ones! Remember to explain to your child that they aren’t helping YOU they are helping themselves and hopefully pitching around the house will become second nature as they hit the teen years (a mom can hope, right?!). Want to know how other moms juggle it all? Join us in the mom.life app where real moms share their tips and tricks for making mom life work for them.